TAKE SQ.FOOTAGE OF TENT AND DIVIDE BY 9/12/6 TO GET SEATING CAPACITY. OR UP TO 200 PEOPLE FOR DANCING. WALLS ARE $1.00/DAY PER FT. THERE IS 1 WINDOW WALL AND 1 WALL WITH A DOOR. NEED 6 WALLS ( ) TO ENCLOSE TENT COMPLETLY. IN CITY SETUP AND TEAR DOWN INCLUDED IN RENTAL PRICE. OUT OF TOWN DELIVERY IS CHARGED AT 2.00 PER LOADED KM. 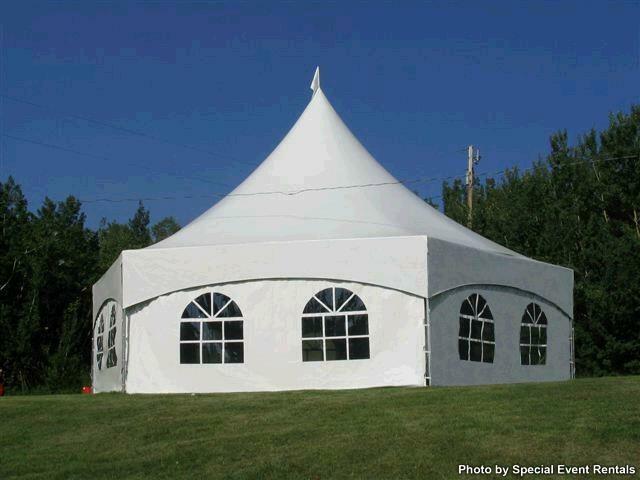 * Please call us for any questions on our tent 40 foot x34 foot hex 1040sq.ft. rentals in Regina SK and Southern Saskatchewan, including Moose Jaw, Pilot Butte, Lumsden, White City, and Fort Qu’Appelle.